Henry Francis Imholt was born on 4 February 1933 at Catawba, Price, Wisconsin. Henry Francis Imholt married Ann Fetherston McMurchie on 9 June 1972 at Tacoma, Pierce, Washington. Henry Francis Imholt died on 25 April 2011 at age 78. Married Name 9 June 1972 As of 9 June 1972,her married name was Imholt. Ann Fetherston McMurchie married Henry Francis Imholt, son of Henry Bernard Imholt and Pearl Emma Banwart, on 9 June 1972 at Tacoma, Pierce, Washington. (?) Collins married Leona F. Imholt, daughter of Henry Bernard Imholt and Pearl Emma Banwart, before 1980. Married Name 5 August 1961 As of 5 August 1961,her married name was Hackl. Virginia R. Mueller was born on 1 April 1943 at Spring Green, Sauk, Wisconsin. Virginia R. Mueller died on 5 May 2016 at age 73 Virginia R. Hackl age 73 of Spring Green passed away on Thursday, May 5, 2016 at Greenway Manor Nursing Home in Spring Green. She was born on April 1, 1943 in Spring Green the daughter of Wilbert and Mary (Gruber) Mueller. Virginia was married on August 5, 1961 to William E. Hackl. She was a member of St. John’s Catholic Church. Virginia was very devoted to her family and church and she loved the Milwaukee Brewers. Survivors include, her husband, William Hackl of Spring Green, 3 children, Janeen (Kevin) Eberle of Lone Rock, Keith (Rebecca) Hackl of Plain, Dean Hackl (Sara Leverson) of Lone Rock, 6 grandchildren, Stephanie (Scott) Potter, Rebecca (Jesse) Weidner, Scott (Rachel) Eberle, Julie Eberle, Steven Peterson and Erin Hackl, 5 great grandsons, Blake and Bentley Potter, Brayden and Bransyn Eberle and Ashton Peterson, a sister, Alice Frederick of Arena, a brother, Henry Mueller of Plain, brothers-in-law, Jack Hogan, Jim Hackl, Bob (Phyllis) Hackl, Byron (Sandy) Hackl, sisters-in-law, Betty Wardle, Bonnie (Denny) Longmeir, Bonnie Marie Hackl, many nieces, nephews, other relatives and friends. She was preceded in death by her parents, Wilbert and Mary Mueller, a son, Kevin Hackl, 2 sisters, Marian Feiner, Dorothy Hogan, brothers-in-law, Ralph Feiner, Jerry Frederick, Don Hackl, Ken Wardle and a sister-in-law, Carolyn Hackl. A Mass of Christian Burial will be held on Wednesday, May 11, 2016 at 11:00 A.M. at St. John’s Catholic Church in Spring Green. Fr. Mike Resop will officiate with burial in the church cemetery. Visitation will be held on Tuesday, May 10, 2016 from 5:00 P.M.-8:00 P.M. at the Richardson-Stafford Funeral Home in Spring Green and again on Wednesday at the church from 10:00 A.M. until the time of Mass at 11:00 A.M.. Memorials may be made to St. John’s Catholic Church or to St. John’s Catholic School Endowment Fund. Kevin Hackl was the son of Virginia R. Mueller. Kevin Hackl died before 2016. Jack Hogan married Dorothy Irene Mueller, daughter of Wilbert H. Mueller and Mary Margaret Gruber. Name Variation Karen L. Meixelsperger was also known as Kitty. Karen L. Meixelsperger was born on 21 December 1954. She was the daughter of Richard J. Meixelsperger. Karen L. Meixelsperger died on 30 April 2016 at age 61 Karen L. “Kitty” Meixelsperger, 61, of Middleton, passed away peacefully at her home on Saturday April 30, 2016. Karen was born on December 21, 1954 to Richard and Carol (Liegel) Meixelsperger. Kitty graduated from River Valley High School in Spring Green. She was a very caring person who enjoyed spending time with her family and friends. She worked meticulously for 43 years at Graber (now Springs) Window Fashions in Middleton and was also an avid sports enthusiast with a wicked fastball, a crafty chip shot and a zest for the Packers. Kitty is survived by her mother Carol Meixelsperger of Plain, siblings: Jane (Timm) Prouty of Elizabethtown, Kentucky; Rick of Spring Green; Ruth (Fred) Schreiner of Spring Green; Jeff (Mary) of Dublin, Ohio; Mary (Bernie) Andrews of Galesburg, Illinois; Rory (Tracey) of Plain and Mike (Lauri) of Prairie du Sac as well as a very special life-long friend Cheryl Alt of Middleton and Godparents Florian and Dorothy Frank. She is also survived by nephews and nieces: Lacey (God daughter), Tyler, Nathan, Tezra, Erin, Jesse, Crystal, Jennifer, John, Katelyn, Anna, Claire, Jack, Carina and Kyle and other extended family. She was preceded in death by her father, Richard and a brother, Martin. A private Mass in memory of Kitty will be held on Tuesday, May 10, 2016 at St. Luke’s Catholic Church in Plain, WI with family and close friends, per Kitty’s wishes. Memorials may be made to St Luke’s School. Online condolences available at www.staffordfuneralhomes.com. The Richardson-Stafford Funeral Home in Spring Green is assisting the family with arrangements. Martin Meixelsperger was the son of Richard J. Meixelsperger. Martin Meixelsperger died before 2016. Kayla Sue Thering was born on 9 February 1992. She died on 18 April 2016 at age 24 Kayla Sue Thering, 24 of Spring Green, WI passed away unexpectedly on April 18, 2016. 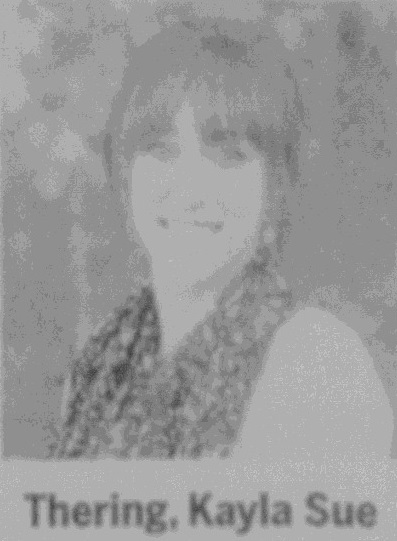 Kayla is the loving daughter of Rob and Sue Thering, born on February 9, 1992 in Richland Center, WI. She was a 2010 graduate of River Valley High School. Kayla took great pleasure in serving her customers at Freddy Valentine’s Public House. She quickly blossomed into everyone’s favorite server, bartender and hostess. Her customers and co-workers became great friends and they enjoyed her charm, grace and charisma. She is survived by her parents, her brothers Kyle (Aron) Thering of Avoca; Craig (Ashley) Thering of Dodgeville; her niece and nephew Nora and Marshall Thering of Avoca; her maternal grandmother, Marietta Gruber of Spring Green and many aunts, uncles, cousins and beloved friends. A Mass of Christian Burial will be on Saturday, April 23, 2016 at St. John’s Catholic Church in Spring Green at 1:00 P.M. with Fr. Mike Resop presiding. Visitation will be held from 10:00 A.M. until the time of Mass at 1:00 P.M. at the church. The Thering family wishes to thank the entire community for the outpouring support during this difficult time. The Richardson-Stafford Funeral Home is assisting the family with arrangements. Online condolences available at www.staffordfuneralhomes.com. Duane Brickl was the son of Michael S. Brickl and Loretta M. Aaron. Duane Brickl died before 2016. Robert Friede married Rita Brickl, daughter of Michael S. Brickl and Loretta M. Aaron. Robert Friede died before 1999. Francis Loy was the son of Annie A. Tennant. Francis Loy died before 2016. Marvin Gray was the son of (?) Gray and Florence White. Marvin Gray died before 2016. Jim Gray was the son of (?) Gray and Florence White. Jim Gray died before 2016. Martin Tennant was the son of Clyde Tennant and Florence White. Martin Tennant died before 2016. (?) Mitchell married Helen Tennant, daughter of Clyde Tennant and Florence White. Cecile Tennant was the daughter of Clyde Tennant and Florence White. Cecile Tennant died before 2016. Russell Kruse was born on 12 November 1926. He was the son of Erwin W. Kruse and Hilda Diehl. Russell Kruse died on 22 November 2015 at age 89 Russell H. Kruse age 89 of Plain passed away on Sunday, November 22, 2015 at the Greenway Manor Nursing Home in Spring Green. He was born on November 12, 1926 the son of Erwin and Hilda (Diehl) Kruse in Plain, WI. Russell served in the United States Army and was married on May 17, 1958 to the former Margaret Hausladen. Russell was a member of St. Luke’s Catholic Church, Plain American Legion Post #398, Knights of Columbus and the 40 Et 8. Russell worked for Ed Kraemer & Sons for over 40 years. Survivors include, his wife, Margaret Kruse of Plain, a brother-in-law, Charles Hausladen of Spring Green, a sister-in-law, Carolyn (John) Frank of Plain, nieces, nephews, other relatives and friends. He was preceded in death by his parents, Erwin and Hilda Kruse, 3 brothers-in-law, George (Jane) Hausladen, Mark and Louis Hausladen, 6 sisters-in-law, Sister Agatha Hausladen OP, Sister Renata Hausladen OP, Gertrude (Emmert) Oehrlein, Armella (Albert) Kowalske, Martha (Edward) Zaidel, Bernice Hausladen, a niece and 2 nephews. A Mass in memory of Russell will be held on Saturday, November 28, 2015 at 11:00 A.M. at St. Luke’s Catholic Church in Plain. Fr. Mike Resop will officiate with burial in the church cemetery where military graveside rites will be conducted by the Plain American Legion Post #398. Visitation will be held on Saturday at the church from 10:00 A.M. until the time of Mass. Memorials may be made to the Plain American Legion Post #398. Online condolences available at www.staffordfuneralhomes.com. The Richardson-Stafford Funeral Home is assisting the family with the arrangements. Married Name 19 November 1952 As of 19 November 1952,her married name was Hunt. Marie T. Lins was born on 19 June 1911 at Sauk, Wisconsin. Marie T. Lins married Walter Hunt on 19 November 1952. Marie T. Lins died on 10 November 2015 at age 104 Marie T. (Lins) Hunt, age 104, passed away on November 10, 2015 at The Meadows Assisted Living in Spring Green. She was born on June 19, 1911, the daughter of Leo J. and Eva (Schwartz) Lins, in the Township of Troy, Sauk County, Wisconsin. She was a lifelong resident of the Spring Green area. She was united in marriage to Walter Hunt on November 19, 1952. Together they owned and operated Hunt’s General Store in Spring Green from 1952 until 1970. Previously, she worked for the Smith Brothers Cheese Company for many years. She was a person of many talents which she put to good use and was a volunteer in many organizations including the Greenway Manor and the advisory council for the Sauk County Commission on Aging. She also was a leader of the 4-H Club and Wilson Creek Homemakers Club and lead the prayers before funerals at the Richardson Funeral Home for 30 years. She was a member of St. John the Evangelist Catholic Church and the Ave Maria Circle. She loved to travel, coordinated trips for senior citizens, enjoyed fishing, camping, crafts, gardening, dancing and playing cards. She was the “BIG SISTER” and always ready and willing to help and sacrifice for her brothers and sisters and the “GREAT AUNT” of her nieces, nephews, grandnieces and grandnephews. Survivors include two sisters: Dorothy Breunig of Prairie du Sac, Eleanora (Elna) Johanning of Madison, and four generations of grandnieces and grandnephews. She was preceded in death by her husband Walter on February 5, 1977, her father on February 11, 1955, her mother on May 4, 1988, five brothers, Clarence, Sylvester, George, Dr. L. Joseph, and Cletus, two sisters, Marcella Breunig and Fredericka (Sr. Mary Pieta f.s.p.a), and three infant sisters. A Mass of Christian Burial will be held at 11:00 AM on Tuesday, November 17, 2015 at St. John’s Catholic Church in Spring Green. Fr. Mike Resop will officiate with burial in the church cemetery. Visitation will be held on Sunday, November 15, 2015 from 2:00 – 5:00 PM at the Richardson-Stafford Funeral Home and again on Tuesday at the church from 10:00 AM until time of Mass. Online condolences available at www.staffordfuneralhomes.com The Richardson-Stafford Funeral Home in Spring Green is assisting the family with arrangements. Walter Hunt married Marie T. Lins, daughter of Leo Joseph Lins and Eva Magdalene Schwartz, on 19 November 1952. Walter Hunt died on 5 February 1977. Married Name 15 October 1946 As of 15 October 1946,her married name was Breunig. Dorothy Eveline Lins was born circa 1924 at Wisconsin. Dorothy Eveline Lins married Sylvester Edmund Breunig, son of Anton Breunig and Anna Bronner, on 15 October 1946 at Spring Green, Sauk, Wisconsin. Sylvester Edmund Breunig was born on 1 March 1923 at Roxbury, Wisconsin. He was the son of Anton Breunig and Anna Bronner. Sylvester Edmund Breunig married Dorothy Eveline Lins, daughter of Leo Joseph Lins and Eva Magdalene Schwartz, on 15 October 1946 at Spring Green, Sauk, Wisconsin. Sylvester Edmund Breunig died on 19 June 2006 at Honey Creek, Sauk, Wisconsin, at age 83 Sylvester Edmund Breunig, age 83, passed away peacefully on Monday, June 19, 2006, at the family farm in Honey Creek. He was born on the family farm in Roxbury on March 1, 1923, the son of the late Anton and Anna (Bronner) Breunig. Sylvester's school days at St. Norbert's in Roxbury never faded from his memory. He was a veteran of World War II, having served in the U.S. Army 42nd Rainbow Division during the Battle of The Bulge. Sylvester was united in marriage to Dorothy Eveline Lins on Oct. 15, 1946, at St. John's Catholic Church in Spring Green. He was a lifetime farmer and greatly loved his family. Driving tractor, helping on the farm, and playing cards were his favorite pastimes. He was a member of St. Aloysius Catholic Church, the Catholic Knights and American Legion Post 167. He is survived by his wife of 60 years, Dorothy; 11 sons and four daughters, Gerry (Kathy) of Prairie du Sac, Kathleen (Larry Sliffe) Breunig of Madison, Louise (Dave) Frosch of Prairie du Sac, Ralph (Barb) of Lodi, Ken of Sauk City, Marcie (Bill) Baures of Waunakee, Tom (Kathy) of Prairie du Sac, Randy (Vicki) of Sauk City, Phil (Theresa) of Greenfield, Eric of Prairie du Sac, Nick (Mary) of Fountain City, Brian of Sauk City, Dan (Kay) of Dane, David (Danielle) of Prairie du Sac, and Kris (Steve) Haag of Sauk City; 35 grandchildren; six great-grandchildren; a brother, Edgar (Marcella) of Mazomanie; two sisters, Mathilda Gallagher of Monona, and Salome Henn of Sauk City; numerous nieces, nephews and friends. In addition to his parents, he was preceded in death by five brothers, Alphonse, Gregory, Otto, Victor, and infant Benno. A Mass of Christian Burial will be held at ST. NORBERT'S CATHOLIC CHURCH, Roxbury, at 11 a.m. on Thursday, June 22, 2006, with Father Kevin D. Holmes officiating. Burial, with military rites conducted by Lachmund-Cramer V.F.W. Post 7694, will be in St. Norbert's Cemetery. Friends may call at ST. NORBERT'S CATHOLIC CHURCH, from 4 p.m. until 8 p.m. on Wednesday, June 21, 2006, and also at HOOVERSON FUNERAL HOME, Sauk City, after 10 a.m. on Thursday, June 22, 2006. In lieu of flowers, memorials are preferred. Name Variation Eleanora Kathleen Lins was also known as Elna K.
Married Name May 1954 As of May 1954,her married name was Johanning. Eleanora Kathleen Lins was born circa 1935 at Wisconsin. Eleanora Kathleen Lins married William John Johanning in May 1954 Eleanora Lins and William Johanning marriage announcement. William John Johanning was born before 1936. 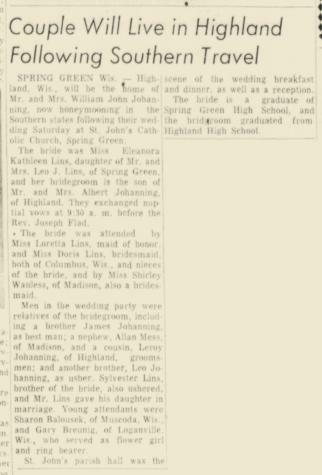 He married Eleanora Kathleen Lins, daughter of Leo Joseph Lins and Eva Magdalene Schwartz, in May 1954 Eleanora Lins and William Johanning marriage announcement. Clarence Lins was born circa 1910 at Wisconsin. Clarence Lins died before 2013. 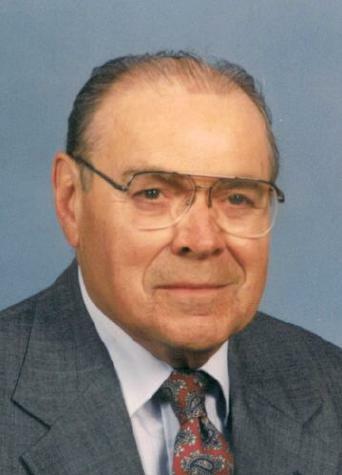 Dr. L. Joseph Lins was born on 11 October 1918 at Spring Green, Sauk, Wisconsin. Dr. L. Joseph Lins married Loretta M. Witzko on 13 June 1942. Dr. L. Joseph Lins died on 27 January 2013 at Fitchburg, Wisconsin, at age 94 Dr. L. Joseph Lins, age 94, Professor Emeritus, School of Education, University of Wisconsin-Madison, died on Sunday, January 27, 2013 at Agrace Hospice in Fitchburg, WI. He was born on October 11, 1918, at Spring Green, Wisconsin, the son of the late Leo J. and Eva (Schwartz) Lins. He married the former Loretta M. Witzko at St. Barnabas Parish, Mazomanie, Wisconsin, on June 13, 1942. Dr. Lins received his Bachelor of Science degree with honors from the Platteville State Teachers College in 1939. He received his Master of Philosophy degree in School Administration in 1944 and his Doctor of Philosophy degree in Teacher Education and Statistics in 1946 from the University of Wisconsin-Madison. "Joe" held a variety of positions at the University of Wisconsin including: Assistant to the Dean, School of Education; Associate Director, Testing and Evaluation Services; Project Administrator, UW-Sears Roebuck Foundation Individually Guided Education Teacher Education Project; Associate Faculty, R&D Center for Cognitive Learning; Coordinator of Institutional Studies; Acting Registrar and Director of Admissions; Director of Student Personnel Statistics and Studies; and Director of Statistics and Machine Records. He left a legacy in education that included his pioneer work in Institutional Studies (a field in which he was recognized nationally as a "father" of the discipline and as an author of what was the widely considered for many decades to be the "bible" of Institutional Research); helping to integrate the state's universities and colleges into one University of Wisconsin system; establishing reciprocity between Wisconsin and its neighboring states to enable students to be schooled in out-of-state programs not offered in their state, at in-state tuition rates; and educating future educators on the benefits of instructing students on an individually guided basis. His family considers one of his greatest legacies to be his continual demonstration of how to transcend obstacles to live a full, rewarding, and successful life. One of his favorite sayings was, "The impossible just takes longer." Born with a brachial plexus injury to his left arm, he showed how to persevere and achieve great things in life such that no disability was apparent. His deep devotion to his faith was evident in the way he used that faith to endure hardships such as the loss of loved ones, loss of eyesight, and loss of mobility and strength. Never complaining, he took each challenge in stride and embraced the richness of life no matter the circumstance. He maintained his incredible intellect, wisdom, sense of humor, and humble nature to the last days of his life. He was a devoted father, grandfather, and great-grandfather to his six surviving children: Dr. Robert J. (Meredith) Lins, James W. (Sue) Lins, Marcia A. (Ronald) West, Mary J. (Dr. Donald) Wackwitz, Kathryn M. (James) Kline, and Dr. Steven J. (Debra) Lins; his 14 grandchildren: Matthew (Eden) Lins, Ryan Lins, Brett and Jennifer Phillips, Kimberly (Andrew) Andrich, Dr. Brian (Katie), Jeffrey (Katie), and Daniel (Melissa) Wackwitz; and Kevin, Kelly, Marc, Colleen, Cassandra, and Mitchell Lins; and his five great-grandchildren: Blaise and Isaac Andrich; Addy and Joshua Wackwitz; and Lennen Lins. He is also survived by three sisters: Marie T. (Walter) Hunt, Dorothy E. (Sylvester) Breunig, and Elna K. (William) Johanning. He was preceded in death by his parents, his devoted wife and loving companion Loretta on November 17, 1993; two sisters: Sr. Mary P. Lins and Marcella M. (Edgar) Breunig, and four brothers: Clarence S., Sylvester J., George T., and Cletus L. Lins. He especially enjoyed reading, woodworking, and travel, having visited all 50 states of these United States, many European Countries, and did extensive travel in the Holy Land of Israel. He received a citation from Pope John Paul II for his contributions to Catholic education. Funeral services will be held at 11:00 a.m. on Monday, February 4, 2013, at St. Ann's Catholic Church with Msgr. Gerard Healy officiating. Friends may call at the Cress Funeral Home, 206 W. Prospect Street, Stoughton, on Sunday, February 3rd, 2013, from 2:00 p.m. to 4:30 p.m. where a rosary (Memorial) service will be held at 4:00 p.m. and on Monday, February 4, 2013, from 10:00 a.m. until the time of services at the church. Internment will be in the Resurrection Mausoleum, Madison. Cletus Leonard Lins was born on 1 August 1929 at Spring Green, Sauk, Wisconsin. Cletus Leonard Lins died on 1 November 2002 at age 73. Married Name 23 August 1949 As of 23 August 1949,her married name was Breunig. Marcella M. Lins was born circa 1926 at Wisconsin. Marcella M. Lins married Edgar P. Breunig, son of Anton Breunig and Anna Bronner, on 23 August 1949 at Spring Green, Sauk, Wisconsin. Marcella M. Lins died on 10 December 2008. Edgar P. Breunig was born on 12 January 1917 at Roxbury, Wisconsin. Edgar P. Breunig married Marcella M. Lins, daughter of Leo Joseph Lins and Eva Magdalene Schwartz, on 23 August 1949 at Spring Green, Sauk, Wisconsin. Edgar P. Breunig died on 28 April 2014 at age 97 Edgar P. Breunig, age 97, passed away on Monday, April 28, 2014, at The Ridges in Lodi. He was born in Roxbury on Jan. 12, 1917, the son of the late Anton and Anna (Bronner) Breunig. Edgar was a World War II veteran, having served in the South Pacific from Jan. 20, 1942, until Nov. 9, 1945. He was united in marriage to Marcella Lins on Aug. 23, 1949, at St. John The Evangelist Catholic Church in Spring Green. She preceded him in death on Dec. 10, 2008. Edgar was a lifetime farmer, working on the farm into his nineties. He greatly loved his family, baseball and the Packers. He was a member of St. Norbert Catholic Church in Roxbury, the Catholic Knights, Knights of Columbus, a longtime president and director for Berry and Roxbury Mutual Insurance Company, and also helped with funerals at St. Norbert's. He is survived by two sons, Charles (Kay) Breunig and Francis (fiancée, Peggy McBride) Breunig; two grandchildren, Dr. Adam (Michelle) Breunig and Lauren (Drew) Davison; three great-grandchildren, Preston, Kennedy and Kaleb Davison; a sister, Salome Henn of Sauk City; two sisters-in-law, Mary Breunig and Dorothy Breunig; many nieces and nephews, other relatives and friends. In addition to his parents and wife, he was preceded in death by six brothers, Alphons, Gregory, Otto, Victor, Sylvester and infant, Benno; a sister, Mathilda Gallagher; and two brothers-in-law, Elmer Henn and Marlyn Gallagher.